If you’ve ever wondered what the fallout from bad publicity looks like on Facebook, just check out the comments on Abercrombie & Fitch’s FB page in April and May. 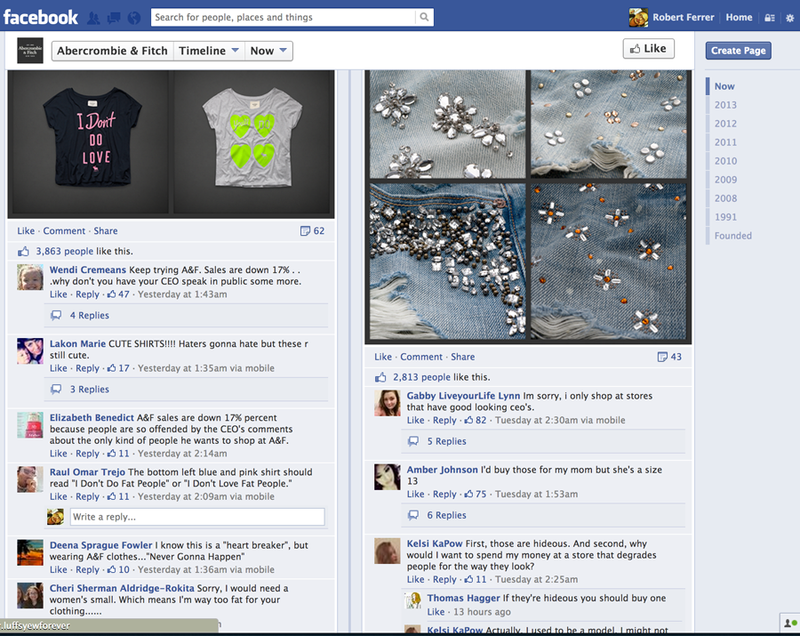 Don’t be fooled by the “likes” underneath each product posting. They haven’t translated into sales. In fact, there was a 17% drop in US sales last month, which some attribute to a stream of incidents and criticism, starting with CEO Mike Jeffries’ 2006 comments in a Salon.com interview that positions A&F as the exclusionary brand for the attractive, “cool kids,” a young man’s YouTube crusade to clothe the homeless with their brand, mock ads confronting its size policy, and Jeffries’ apology on FB followed up by the company’s formal apology. Now compare that to the comments on Dove’s Facebook page last month during its “Real Beauty” campaign, where they launched their “Real Beauty Sketches” video on YouTube, depicting various women describing their faces to a sketch artist, followed by strangers describing those same people to the same artist—the final message being, you’re more beautiful than you think. For their part, Dove has received its share of criticism, both for its message and for positioning itself as a “responsible” brand, when its Unilever cousin Axe personal care products for men plays its target consumers off stereotypically beautiful young women. When comparing their social media strategies, Dove’s communication, while staying on message, tends to evolve, whereas A&F’s strategy, in the face of its critics, feels stagnant, somewhat in a state of denial. 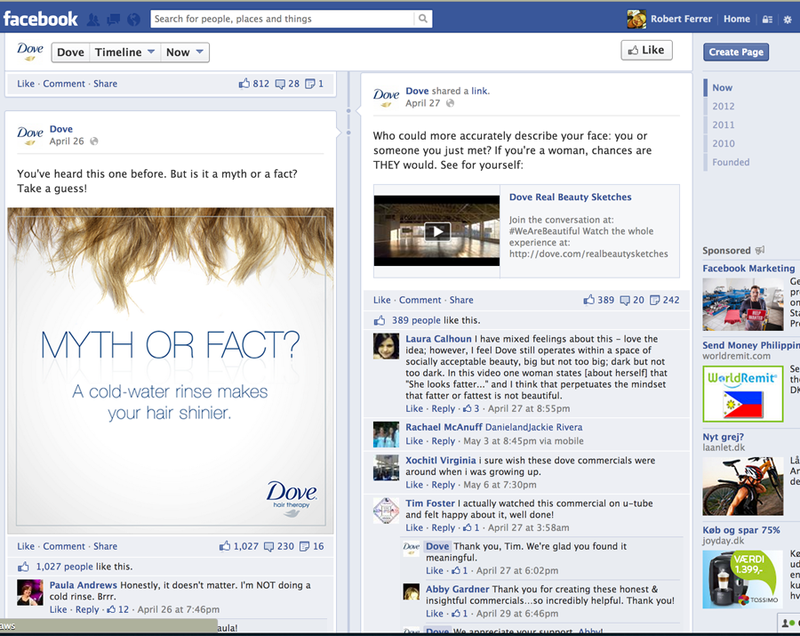 I can appreciate Dove’s message, fully aware that it was professionally crafted by its ad agency, Ogilvy Toronto. Like it or not, sending out messages that aim to boost women’s confidence in their appearance has value—put another way, self-esteem sells. It’s easy to reflect on their intentions with cynicism—especially when compared to A&F’s unabashed and until recently, unapologetic campaign. But take a look at their respective sites, and you can see that the key difference is, Dove’s strategy is in this for the long haul. They are growing customers for life, and that kind of brand loyalty is built on creating an emotional connection the customer. That connection is intertwined with trust. And when corporations misstep—as they occasionally do—especially where social media is involved, who is better prepared to handle the fallout? ©2018 Ferrer Creative. All rights reserved.